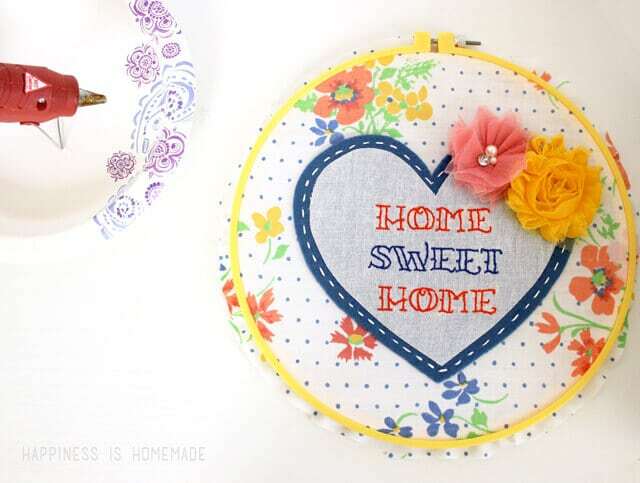 I absolutely adore hoop art, and I have had “Make Cute Hoop Art” on my to-do list for a really, really long time now, so I was excited to find a few spare minutes the other day to whip this up. 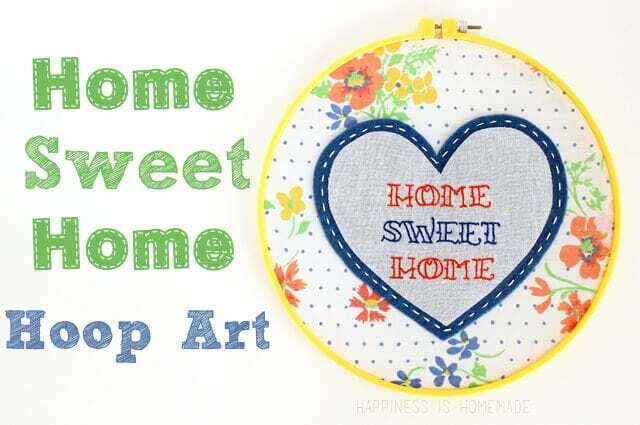 My cute “Home Sweet Home” hoop is inspired by two of my friends (and favorite hoop art creators! ), Bev from Flamingo Toes and Erica from Spoonful of Imagination. 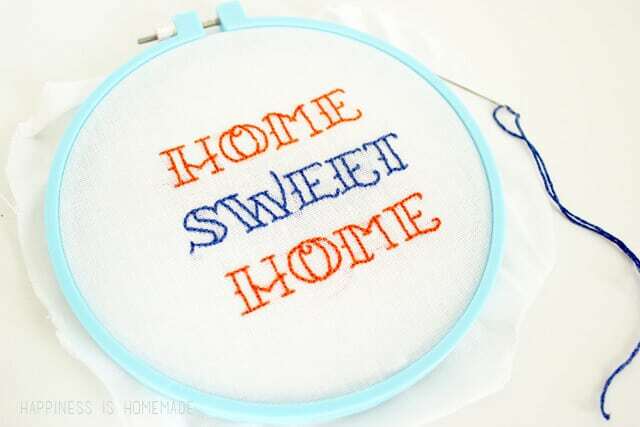 I started by transferring Bev’s “Home Sweet Home” pattern to a piece of scrap fabric, and embroidering it with a simple short backstitch using four strands of floss. 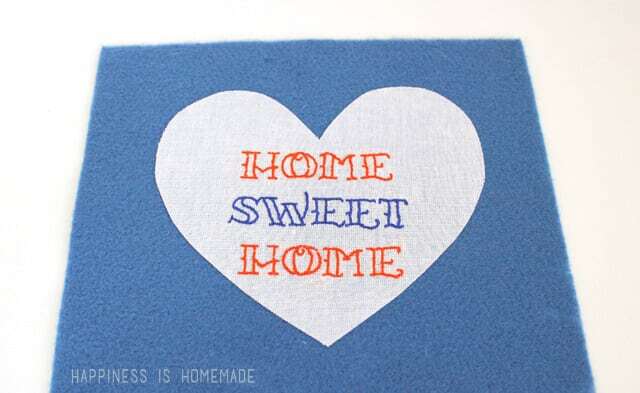 When I was finished, I ironed double-sided fusible interfacing to the back, and cut the fabric around the embroidery into a heart shape. I used a vintage sheet for the background of my artwork, and stitched around the edges of the felt heart to secure it to the fabric. …and you guys responded overwhelmingly that the flowers should stay. My hubby, however, didn’t agree with y’all (sorry, ladies!). We both really like the idea of adding flowers, but weren’t sold on these ones. I’ll find time to make some perfectionist approved custom flowers in the future, but for now the hoop art is staying plain and simple. To finish the hoop, I trimmed the sheet and used hot glue to glue down the edges inside the hoop. You can also glue down a large circle of felt to cover the entire backside of the hoop if you feel like taking the time to make it look extra clean and tidy, but I skipped that step, too. 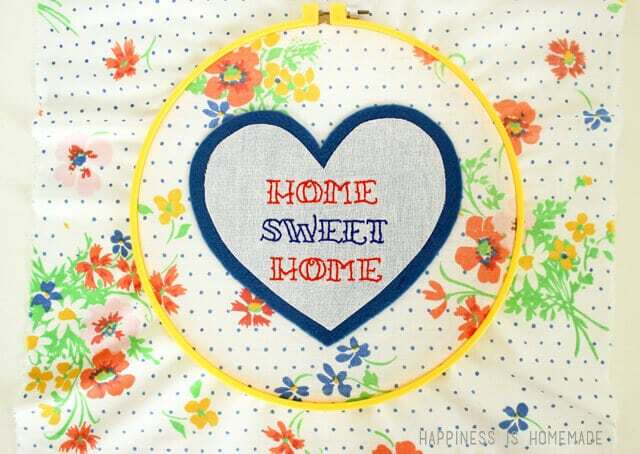 I think I might have a serious addiction to creating hoop art after this! I love this! 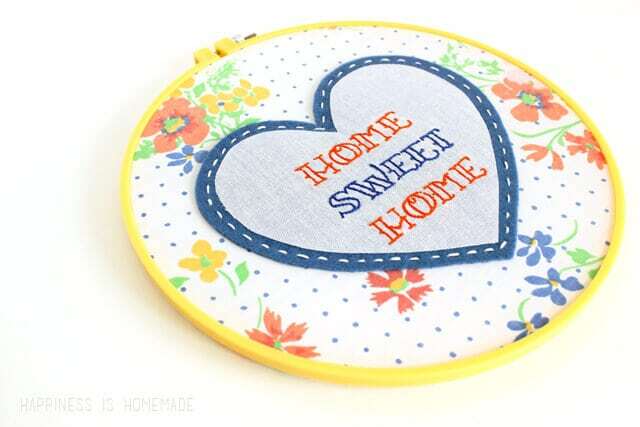 I always have hoop art on my list, but somehow it never makes it to the top. I really need to do something about that because this is toooooo much! Now you’ve got me wanting to make one! I love the colors. 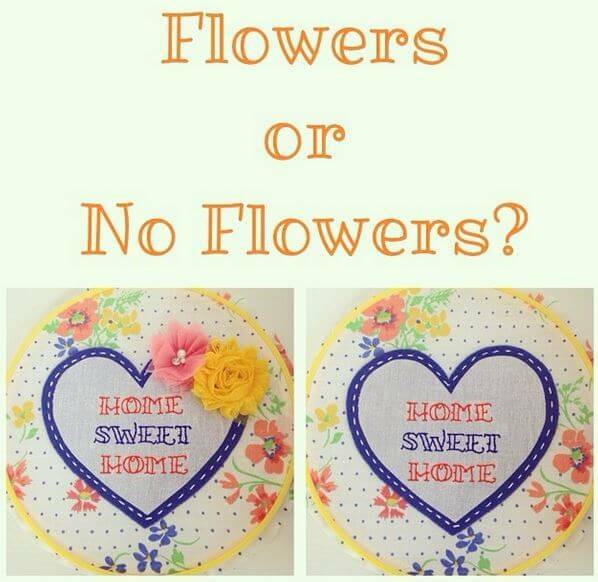 I really like your flowers but prefer the hoop art simply without the cute flowers because I think they take away from that awesome fabric. 🙂 Fun project! So cute!! I did some embroidery as a girl, but this makes me want to take it up again! So adorable! Love the way it came out! I love this! 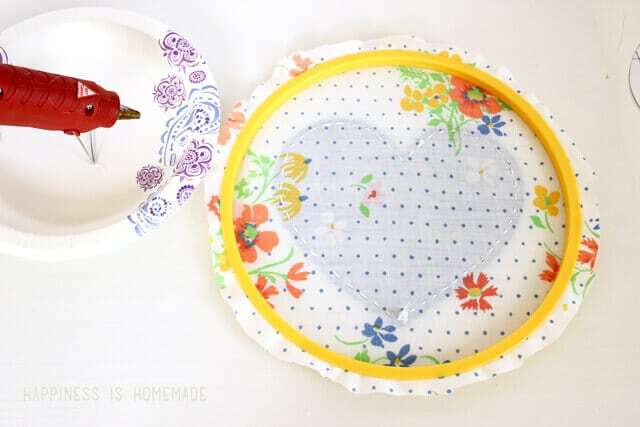 I especially like it with the flowers, so cute! Cute! And what a fun decor piece. Yup, I agree with your husband. No flowers for me. 🙂 I can see the design better without the flowers.